FlossieBlossoms: The Doll Quilt Swap is up and running again! The Doll Quilt Swap is up and running again! This is the new hot spot in our house- my friend Jennifer gave me 2 towels when we were at her house a couple of weeks ago. 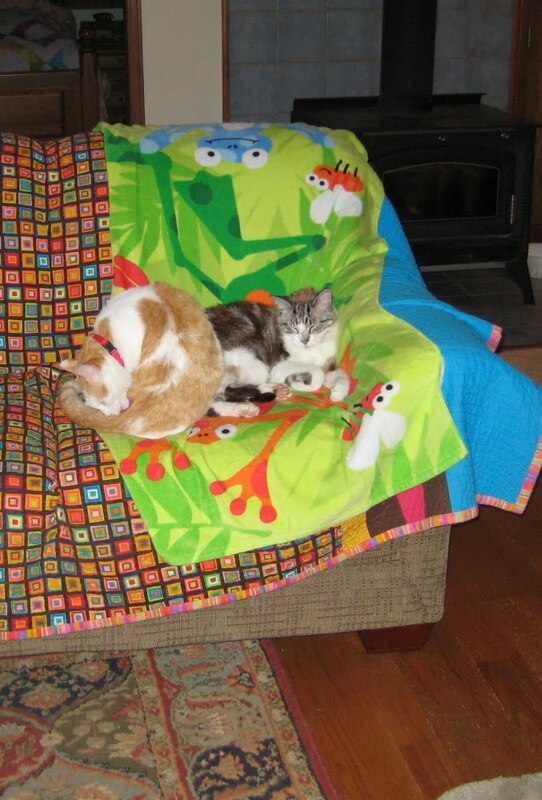 The cats have all commandeered them! They are really soft and squishy, the towels, I mean... well, the cats are too, but I'm talking towels now....and they just all take turns lying around on them. 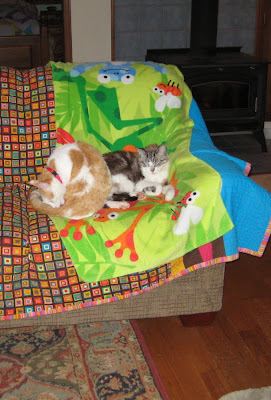 This is Beeswax and Murphy, the brothers, on the lime green froggy towel. I just love these big boys! Parker likes to lay on it or under it in the late evening, before bedtime. Last Sunday the participants of DQS9 were notified (something like 200 of them!) by their swap mamas and given the name of the person they would be creating a little treasure for. This was an eagerly awaited notification, we were all chomping at the bit, even the mamas, because they are making for someone also. To get to that point, though, first the mamas are assigned their group and then they have to investigate each and every person by prowling through their Flickr photostream and their blog, if they have one and also the photo mosaic and/or photo favorites or gallery of inspirational quilts that they have marked. Notes are made on each person in various catagories and then match ups can begin. After that's all settled, emails are composed and ready to go when the time comes and all the "bebes" are notified at about the same time. Then THEY get to investigate their partner that they are sewing for and come up with plan for a little quilt. Sketches are posted, fabric selections are photographed, discussions ensue from the serious to the bawdy, and a good time is by all. Well, by all who participated in it. There are still some very quiet quilters that don't say much and that's kind of a shame for their partners because any kind of feedback is better than no feedback at all. If I had my way, every single person would devote 15 minutes a day to commenting on other people's photos and ideas. Not only will make those people feel good, it's also inspiring and fun to see all the great ideas and colors and fabrics. It's early days, though, it's only been a week, but I've already seen one finished quilt and a lot of great ideas posted. We have until the end of August to make them, so I'm hoping to get inspired soon and find just the right thing to make for my partner. I don't know what it'll be yet, but I do know this- this is the most fun swap I've ever been in, it's well run and very organized and the people who take part in it are extremely talented and fun and witty. I'm so pleased to be in it again for the 2nd time. Yeah for DQS and the Mamas. Those kitties are awfully cute. I bet Jennifer loves that her towels are getting so much love. The mama's are all doing a lot of good work! and the care that is going into this swap is part of what makes it so successfull! I am one of the quiet ones (well for the moment...) but that hopefully changes when the windows are in and the sewingroom is unpacked!! I am LOVING being part of this swap for the first time and just need to build that 15 mins in to every day! Only problem is, it is too addictive for only 15 mins! I couldnt do it this round. Bummed. But am looking forward to the next one. Hopefully summer camping and playing will be winding down.